AOL co-founder Steve Case will be the inaugural speaker for Anchor Ventures’s speaker series. Anchor Ventures is a collaboration between University of Maryland Ventures and Johns Hopkins Technology Ventures. 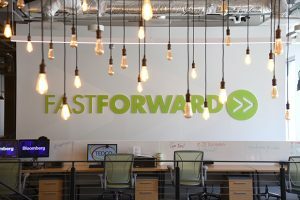 The series will bring in speakers to inspire and support the development of startups and technology companies in Maryland. The speaker series events will take place the third Thursday of each month, and cover a range of startup topics, including ideation, startup development and commercialization. Case will highlight the first event, from 4 to 7 p.m. Feb. 14th at Johns Hopkins FastForward 1812 space. The first event will also feature a startup panel that will present to Case. Anchor Ventures was created as a collaboration between the two universities and is funded by the Maryland Technology Development Corporation (TEDCO) as part of its Incubation Challenge. Through its programming, like the speaker series, Anchor Ventures hopes to build a more connected innovation ecosystem in the state. That includes education opportunities, networking, mentoring and collaboration with veteran entrepreneurs.